Objective: God loves us so much that He sent Jesus to the world as a baby. 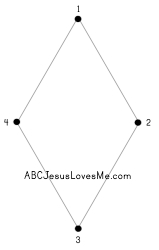 It says in the Bible that Jesus loves us so much that He humbled Himself and became a man (Phil 2:5-8). Do you think it was hard for Jesus to leave Heaven and come down to earth as a baby? 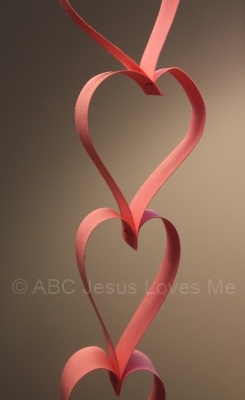 Verse: John 3:16a - For God so loved the world that He gave His one and only Son. - God Gave Us Love by Lisa Tawn Bergren is a precious story about a Little Cub who questions why we must love others, even the seemingly unlovable. - Make Cinnamon Heart Ornaments to give away and tell people the story of God's love. Directions: Stir ingredients until they form a soft ball. If the dough is too dry, add more applesauce. If the dough is too wet, add more cinnamon. Dust a flat surface with cinnamon. Roll out the dough with a rolling pin or press with your fingers to approximately 1/4" thick. Rolling the dough too thin makes the ornaments brittle. Thick ornaments take longer to dry. Use a cookie cutter to create your shapes. 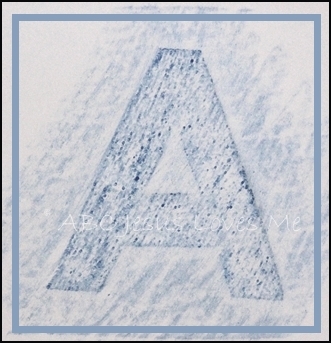 To make the letter shapes or imprints (as pictured above), push a straw or cookie cutter approximately half way into the dough. Poke a straw through the dough to create a hole for a string. Let the ornaments dry on a baking rack. Depending on thickness, this will take at least 24 hours. For quicker results, place the ornaments in a dehydrator or a 150 degree oven (gently flipping every hour) until done. - Cut small squares of two different colors of tissue paper. Place a thin layer of glue on the baby in the Mary Holding Baby Jesus workbook. Cover with one of the sets of squares. Place a thin layer of glue on Mary and place the other set of squares. Once dry, cut out Mary. Add string to the back and hang on the Christmas tree. Angels - wave arms like angel wings. People had been waiting for a very long time. As a matter of fact, people had been waiting since the first man and woman had to leave God's special garden because they disobeyed. They were waiting for God to keep His promise to send them a Savior. One day an angel spoke to a girl named Mary and told her she was going to have a baby . Then the angel spoke to a man named Joseph , who was going to be Mary's husband. The angel told Joseph that Mary's baby was special. He was God's son, Jesus! While Mary and Joseph were waiting for Jesus to be born, they had to go on a long trip. The ruler of the land had made a law that people had to go to their hometowns and write their names in a special book so that leaders could count how many people there were. So Mary and Joseph had to travel to Bethlehem to be counted. They had to walk all the way! Finally, they arrived in Bethlehem. Mary was ready to have her baby. But Bethlehem was so crowded that they couldn't find a place to stay! Everywhere they went they were told, "There is no room!" Finally, a kind innkeeper said they could stay in his stable. And just in time, too! That night Jesus was born! Mary wrapped the baby with pieces of cloth and laid him in a manger to sleep. All of the angels joined in and said, "Glory to God! Peace on earth to those who love God!" - Create a Four Seasons Wheel using the Four Seasons worksheet. This week focuses on fall and winter. 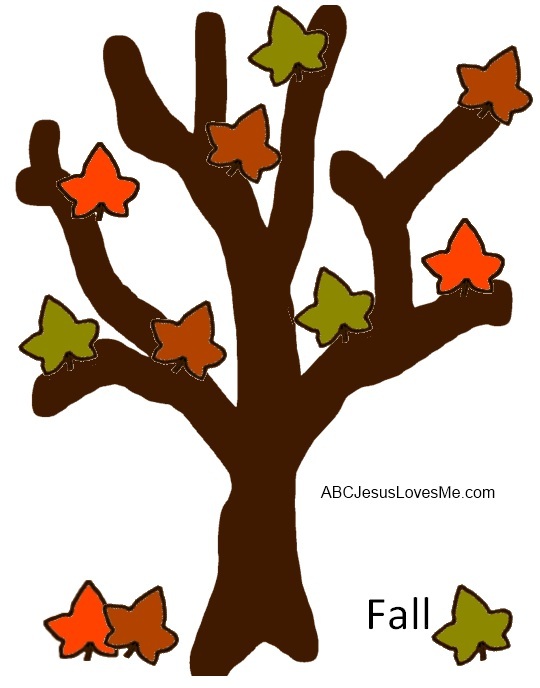 Print the Fall Tree and add fall-colored leaves. 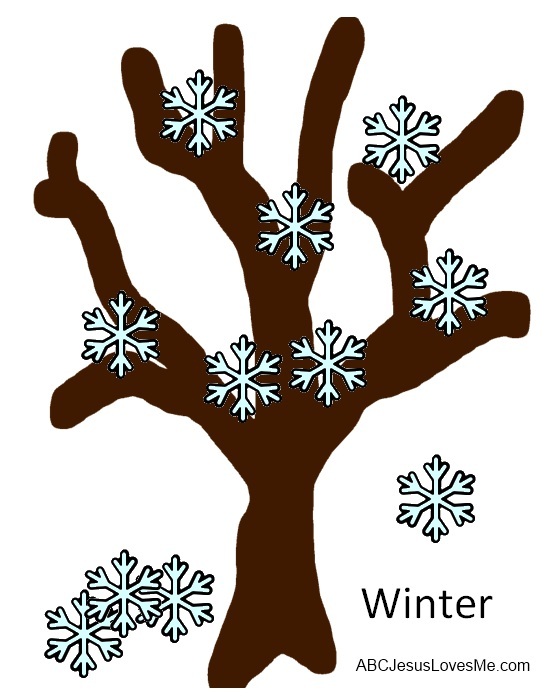 Print the Winter Tree and add snowflakes. Post the finished Winter Tree on a wall with the Fall Tree under and to the left of the Winter Tree (at 9:00). Add pictures around each picture to depict the season. Also add names or pictures of people whose birthdays are in each season. Add the arrow moving from fall to winter. Week 18-21 focuses on the lowercase "c" characters. This week focus on c, a, d . Start by creating the characters using play dough snakes or pipe cleaners for the bubbles and move to writing the characters on the Lowercase "c" Characters worksheet to show the progression of the letters and numbers. Be sure to say the Letter Formation Chant as the child creates each character. Have your child assist you with the card by helping to sign her name and telling you her address. Demonstrate the proper way to address and stamp a card. - Discuss the love our Heavenly Father has for us that He was willing to send His Son down to earth as a baby. - Choose from a list of Valentine "love" activities. Play catch with a beach ball or stuffed animal. Complete the Star Dot-to-Dot Worksheet.